Choosing the glazing for a greenhouse is one of the trickiest parts of the design process. 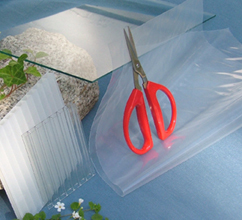 Most people choose thin sheets of so-called greenhouse plastic, the cheapest of which you can often buy locally at a hardware store. Unfortunately, Oehler reports that this ultra-low-end plastic usually only lasts about a year. He finds that the 6 mil, UV-treated plastic available at greenhouse-specialty shops lasts a bit longer (up to four years), but not long enough to be worth the additional price. Moving into the more expensive but more long-lived choices, there are various types of rigid plastics you can use in greenhouses. None of these plastics will last as long as glass since they slowly yellow (blocking light) over time, and since scratches will speed up the decline in light penetration. On the other hand, rigid plastic is safer than glass (especially on roofs) because the plastic won't shatter, and plastic is considerably lighter, making it easier to work with. At the high end, acrylic (aka plexiglass) lasts the longest (25 to 30 years) and gives you the best visibility if view is important to you. Polycarbonate is a slightly cheaper choice, staying clear for about a decade, or up to 35 years if you choose a version that's been UV-treated. Oehler notes that he would probably choose polycarbonate for future roofs. For the walls, Oehler is a fan of scavenging old windows, especially if you can find double-strength B grade. Glass is much heavier than plastics, which makes installation tougher, especially if you double up windows to provide an insulated air space in between. But windows can often be found used or cheap, making them the lowest-cost building option. None of the glazing options have spoken to me in the past, which is one of the big reasons I've been anti-greenhouse. So I'm curious to hear from readers who have experience with greenhouses. Which type of glazing did you choose and how long did it last? Make your garden more productive with easy cover crops. Haven't built my greenhouse yet but I have collected from a window replacement contractor many 2'x4' double glazed window frames from a home that was build in the early 90s so the windows are in excellent condition. With a few double glazed glass sliding doors as well I'm going to build a custom frame suited for my windows. For the roof I'm going to use multiple large windows that are the size of doors. I haven't spent a penny yet other than some fuel to get them. Glass is heavier than plastics but a simple frame can but built strong enough to deal with it. It will have a gambrel or steep gable roof so snow load wont be an issue. With a little spray foam and caulking it will be fairly air tight so I'm hoping with the combination of a small wood stove it'll stay nice and toasty all winter long. I believe the key to using glass is to find OLD recycled windows. 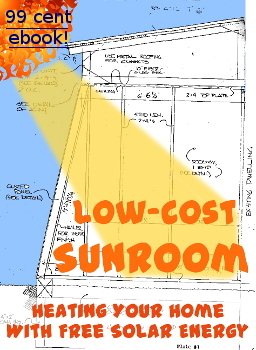 Newer windows are formulated to filter out UV which greenhouse plants need. 30 years plus on the glass in the family's greenhouse. Built out of used windows. 4 years plus on the twin-wall poly-carbonate for my "greenhouse" The triple-wall stuff is strong enough you can walk on it according to some, I've only sourced the twin-wall stuff. It's also the easiest stuff ever to work with. Cut with utility knife, tape with metal tape to seal the tubes. I use it as my winter window covers with ducttape "flaps" to seal the edges and give some room for expansion and contraction. I also like it for cold frames and "clotches" up against my house. I use conduit and plastic hoops for the garden beds but have just NEVER managed to attach plastic at an angle to the house and have it hold. The polycarbonate is an excellent solution - stiff enough, easily cut, drilled and tied down/anchored etc. Think nail hole plus zip-ties. This is one of the few ways which I think modern plastics are oh so amazing and awesome and wonderful and perfect and... cannot say enough good about them and the use of poly-carbonate!! I know. Sorry. Am gushing. The sputter coating blocks around 70% of UV radiation. The pyrolitic coating is not known for blocking UV. Laminated glass however can block up to 99% of UV radiation. There are glass types that maximize solar power transmission, e.g. Guardian's EcoGuard. Of course recycling old window panes is always a good idea. 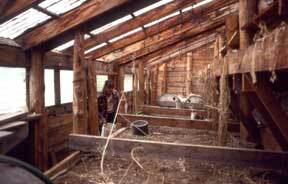 But a modern low-e glass can help keep the greenhouse warmer. Have you looked into a Virginia manufactured polycarb material call TufTex, by Ondura? It is what I will be sourcing for all of my roofing, and possibly siding materials for me homestead(auxiliary buildings that is) up here in New Market, VA this winter and following spring.